This guide contains instructional materials designed to help learners build the basic computer skills defined by the Northstar Digital Literacy Assessments. What is the Northstar Digital Literacy Assessment? 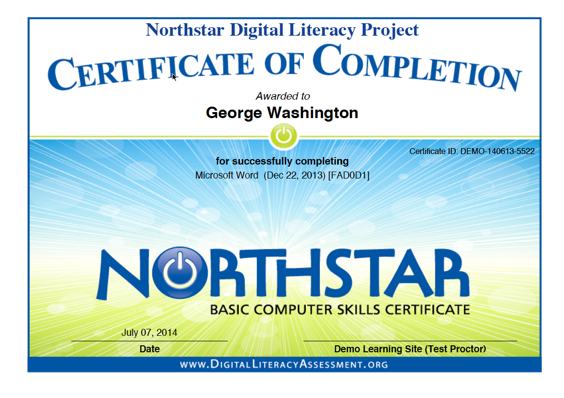 The Northstar Digital Literacy Assessment is a self-guided, online set of assessments that show an individual’s ability to perform basic computer skills in seven skill area areas: Basic Computer Use, Internet, Windows OS/Mac OS, Email, Word Processing (using Microsoft Word), Social Media, Excel, and PowerPoint. Anyone may take the assessments online at www.digitalliteracyassessment.org. At the end of each test, the user receives a page of results that lists the skills that have been mastered and the skills needing work. The tests are also available with closed-captioning. Taking the test is FREE and available to everyone. Individuals who take a Northstar assessment receive a results page at the end of every assessment (sample below). Use the results page to identify the skills that need improvement. Each skill listed on the results page corresponds to a Northstar standard. The skills listed under the left-hand (green) column are skills that have been mastered while the skills listed under the right-hand (red) column are ones that need to be improved. After the skills needing improvement have been identified, navigate to the appropriate module page using the tabs above (for example, the learner in the sample below would navigate to the tab for Module 4: Using Email). Use the table on each indiviudal module page to identify the needed skills, and then simply follow the links to online learning resources that will provide instruction on those skills. Earn your Northstar certificates today! Did you know you can earn earn a certificate in one or all of the test areas when you pass an assessment with a score of 85% or better? The certificates provide a credential for employment. You may take the test as many times as necessary to earn the certificate. To earn a certificate, you must take each test at an approved sponsoring site under proctored supervision. Saint Paul Public Library is an approved sponsoring site for the Northstar certificate program. Ask your librarian for more information on taking an assessment at the library today! If you are outside of the Saint Paul area, you can find a list of other approved sponsoring sites here.